At the Guild’s recent mLearnCon, I was having a conversation in which I was reminded that designing performance interventions is a probabilistic exercise, and it occurred to me that we’re often not up front enough about it. And we need to be. When we start our design process with a performance vision, we have an idea of what ideal performance would be. However, we make some assumptions about the performer and their ability to have comprehended our learning interventions and any resources we design or are available in the context. We figure our learning was successful (if we’re doing it right, we’re not letting them out of our mitts until they’ve demonstrated the ability to reliably perform what we need), and we figure our performance solutions are optimal and useful (and, again, we should test until we know). But there are other mitigating factors. In the tragic plane crash in the Tenerife’s – and pilots train as much as anybody – miscommunication (and status) got in the way. Other factors like distraction, debilitating substances, sleep deprivation and the like can also affect performance. Moreover, there’s some randomness in our architecture, basically. We don’t do everything perfectly all the time. But more importantly, beyond the actual performance, there’s a probability involved in our learning interventions. Most of our research based results raise the likelihood of the intervention affecting the outcome. Starting with meaningful objectives, using model-based concepts, contextualized examples, meaningful practice, all that increases the probability. This holds true with performance support, coaching/mentoring, and more. Look, humans don’t have the predictable properties of concrete or steel. We are much more complex, and consequently variable. That’s why I went from calling it cognitive engineering to cognitive design. And we need to be up front about it. The best thing to do is use the very best solutions to hand; just as we over-engineer bridges to ensure stability (and, as Henry Petrovski points out in To Engineer is Human, on subsequent projects we’ll relax constraints until ultimately we get failure), we need to over-design our learning. We’ve gotten slacker and slacker, but if it’s important (and, frankly, why else are we bothering), we need to do the right job. And tarting up learning with production values isn’t the same thing. It’s easier, since we just do it instead of having to test and refine, but it’s unlikely to lead to any worthwhile outcomes. As I’ve argued before, better design doesn’t take longer, but there is a learning curve. Get over the curve, and start increasing the likelihood that your learning will have the impact you intend. At the recent Guild mLearnCon mobile learning event, I had a thought that seems to answer a long time debate. The debate centers on the definition of a mobile device. The feature/smart phone is obviously a candidate, and tablets seem pretty clearly included too, but the ongoing issue has been whether a laptop counts. And I may have finally discovered a way of looking at it that answers the question. and a battery that will last all day. And this has been pretty good, because most laptops don’t fit the latter criteria, their batteries didn’t used to be able to go all day. However, this is a characteristic-based definition, e.g. about inherent properties of the device, and this can change. The new MacBook Airs, for instance, now have a battery that will last all day. And, even if the 13″ is too big, the 11″ or some other might soon fit the criteria. That is, we’re hitting a moving target. What struck me the other day, however, was looking at it not from inherent properties of the devices, but from usage affordance, i.e. how one uses the device. Because it struck me: to me, it’s not really a mobile device unless you can use it with two hands, standing up or in motion. More importantly, it has to be a natural usage: holding up a netbook with one hand and hunt-and-peck with one hand doesn’t qualify. In short, if you can’t use it with two hands while moving, it’s not really mobile. This strikes me as a way that will inherently allow new devices and new capabilities, yet still clearly distinguish what’s mobile and what’s not. So, for instance, devices with keyboard that turns around and becomes a tablet? A tablet’s mobile: hold with one hand, touch with the other. A two-handed keyboard is not. Will this fall apart? Probably, as the ultimate mobile test is whether it’s a device that goes with you everywhere: to the market, to a party, even to the bathroom. And some may be able to, but which ones really do? Regularly? If I had a small enough tablet, or iPod touch, probably, but the phone, yes! However, in some contexts, e.g. work, a tablet might go with me to all my work contexts, and then it qualifies if it meets the criteria: of being able to used naturally, standing up. This, to me, seems to provide a better criteria, at least for now. What say you? 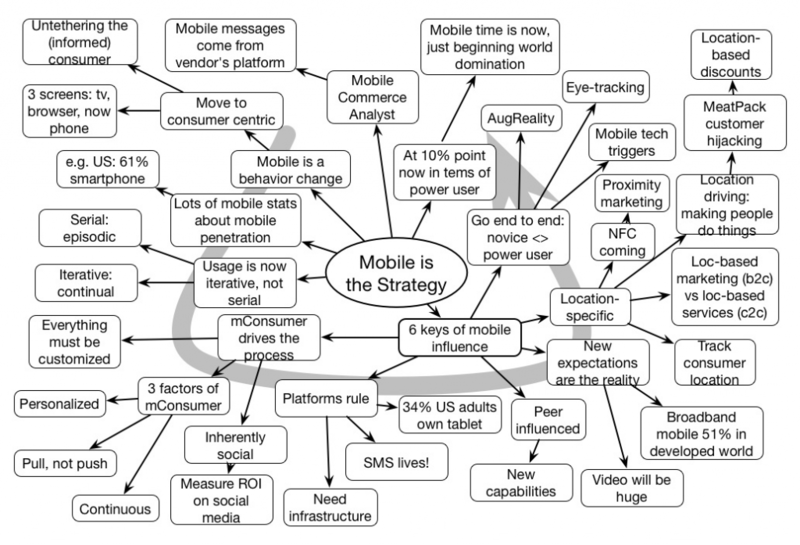 Chuck Martin gave a lively and valuable keynote at #mLearnCon, with stats on mobile growth, and then his key components of what he thinks will be driving mobile. He illustrated his points with funny and somewhat scary videos of how companies are taking advantage of mobile. Christopher Pirie opened the eLearning Guild’s mLearnCon mobile learning conference with a fair overview of technology for learning. He talked about the usual trends, and pointed to some interesting game apps for learning. Kodu, in particular, is an interesting advancement on things like Scratch and StageCast’s Creator. I was somewhat surprised by his pointer to Bloom as the turning point to modern learning design, as I’d be inclined to point more to Collins & Brown’s Cognitive Apprenticeship. I also think he should take a look at Donald Clark’s criticisms of Mitra’s Hole in the Wall. Finally, the characterization between the overhead projector as characteristic of 1991 and the Kinect for 2012 is a bit spurious: in 1991 we also had HyperCard, and in 2012 I don’t see the Kinect in many classrooms yet, but his point is apt about the potential for change we have at our fingertips. Overall, a nice kickoff for the conference. I was asked, somewhat out of the blue, what I wish I’d learned in school, and I thought it an interesting question. I also thought it worth putting out to a slightly broader audience. These are just a few thoughts, but it’s a start. And let me ask what you wish you’d learned in school? 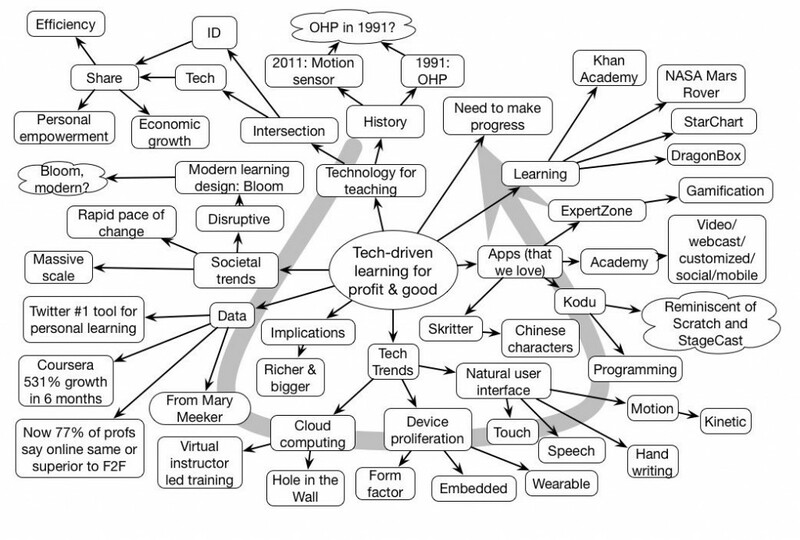 A few years ago, I created a diagram to capture a bit about the technology to support learning (Big ‘L’ Learning). I was revisiting that diagram for some writing I’m doing, and thought it needed updating. The point is to characterize the relationship between underpinning infrastructure and mechanisms to support availability for formal and informal learning. Here’s the accompanying description: As a reference framework, we can think of a hierarchy of levels of tools. At the bottom is the hardware, running an operating system and connecting to networks. Above that are applications that deliver core services. We start with the content management systems, from the delivery perspective, which maintains media assets. Above that we have the aggregation of those assets into content, whether full learning consisting of introductions, concepts, examples, practice items, all the way to the summary, or user-generated content via a variety of tools. These are served up via delivery channels and managed, whether through webinars, courses, or simulations through a learning management system (LMS) on the formal learning side, or self-managed through social media and portals on the informal learning side. Ultimately, these activities can or will be tracked through standards such as SCORM for formal learning or the new experience API (xAPI) for informal learning. I add, as a caveat: Note that this is merely indicative, and there are other approaches possible. For instance, this doesn’t represent authoring tools for aggregating media assets into content. Similarly, individual implementations may not have differing choices, such as not utilizing an independent content management system underpinning the media asset and content development. So, my question to you is, does this make sense? 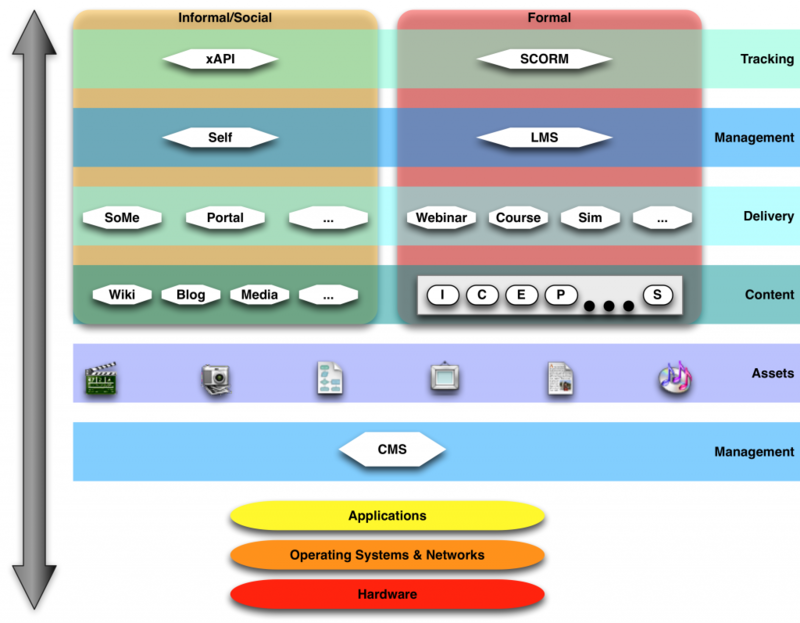 Does this diagram capture the technology infrastructure for learning you are familiar with? In my last post, I asserted that we need evidence-based design for what we do. There are a number of sources for same. Of course, you could go do a Master’s or Ph.D. in cognition and learning, but there are shorter paths. There are several good books out (and I believer that there is at least one more on the way) that summarize the implications of research design. Ruth Clark has been a co-author on a couple, eLearning and the Science of Instruction, and the subsequent Efficiency in Learning. Julie Dirksen’s Design for How People Learn is another good one. Michael Allen’s work on design is also recommended, e.g. Guide to eLearning. Will Thalheimer, Ruth, and Julie regularly write and talk about these things in other forums than books. Go listen to them! I try as well, though often filtered through games, mobile, or elsewhere. There’re others, too. A number of people run workshops on deeper design. I know I have one, and I’m sure others have them as well. Do try to make sure that it covers both cognitive and emotional elements, focusing on meaningful change. There are gaps: there isn’t all the research we need, or at least not digested. The role of emotional engagement isn’t as well fleshed out as we’d like, and some of the research is frankly focused on studies too small to give practical guidelines (c.f. the consternation on serious game design that surrounded a recent post). Where we don’t have research, we have to make inferences from theoretical frameworks, but you should know those too. It’s better than going on ‘intuition’ or folk science. Still, there’s no excuse to do un-engaging, over-written, and under-practiced learning. Better design doesn’t take longer (with the caveat that there’s some initial hiccup ’til we make the change). We have the knowledge, and the tools aren’t the barrier. Let’s do better, please! When we have to act in the world, make decisions, there are a lot of bases we use. Often wrongly. And we need to call it out and move on. As I pointed out before, Kahneman tells us how we often make decisions on less than expert reflection, more so when we’re tired, and create stories about why we do it. If we’re not experts, we shouldn’t trust our ‘gut’, but we do. And we will use received wisdom, rightly or wrongly, to justify our choices. Yet sometimes the beliefs we have about how things work are wrong. While there’s a lot of folk science around that’s detrimental to society and more, I want to focus on folk science that undermines our ability to assist people in achieving their goals, supporting learning and performance. Frankly, there are a lot of persistent myths that are used to justify design decisions that are just wrong. Dr. Will Thalheimer, for instance, has soundly disabused Dale’s Cone. Yet the claims continue. There’re more: learning styles, digital natives, I could go on. They are not sound bases for learning design! It goes on: much of what poses under ‘brain-based’ learning, that any interaction is good, that high production values equal deep design, that knowledge dump and test equals learning. Folks, if you don’t know, don’t believe it. You have to do better! Sure, some of it’s compelling. Yes, learners do differ. That doesn’t mean a) that there are valid instruments to assess those differences, or more importantly b) that you should teach them differently. Use the best learning principles, regardless! And using the year someone’s born to characterize them really is pretty coarse; it almost seems like discrimination. Look, intuition is fine in lieu of any better alternative, but when it comes to designing solutions that your organization depends on, doing anything less than science-based design is frankly fraudulent. It’s time for evidence-based design!